If you need security or safety solution, chat with us about our Commercial and Industrial range. Chain Link fencing – probably the most widely used commercial fencing. Manufactured from the best quality steel wire, chain link comes in a range of gauges, mesh sizes and styles. We recommend its use in areas where a boundary with the public is needed. We often install chain link fencing in children’s play areas and around tennis courts. It also comes in an “anti-climb” version which is ideal for general site security applications. General Mesh fencing – provides a sturdy boundary which retains good visibility making it a popular choice for small sporting venues and children’s play areas. Steel Palisade fencing – the most robust barrier against crime. You can choose from a range of options which balance the best security options while keeping costs down. If you love horses you will want to keep yours safe and secure. 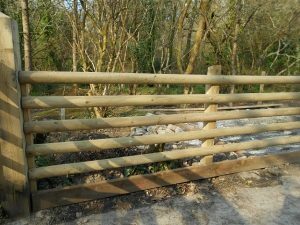 Whilst we can install simple wire or net fences we are sure you will like our range of timber fencing. One of our most popular solutions for the stable yard or paddock is post and rail fencing. This is available in a range of rough cut and machined styles to suit the aesthetics of your site. It is also pleasing on the eye where, as is often the case in West Cornwall, the contours are far from even! Click here to contact us direct for an informal chat.